With the colours, the design language and intense dynamism, she achieves to break almost any interpretation limits. Almost every painting in the series contains a lone figure with views of a certain part of the body - details of female legs, hands, lap, half-figure, headless figure - evoking the seeming deprivation of one's own identity. As it is also the case of Chinese characters, the compositions of Ottó Szabó consist of two (or more) elements: the phonetic one, expressing how to pronounce the character and the meaning. 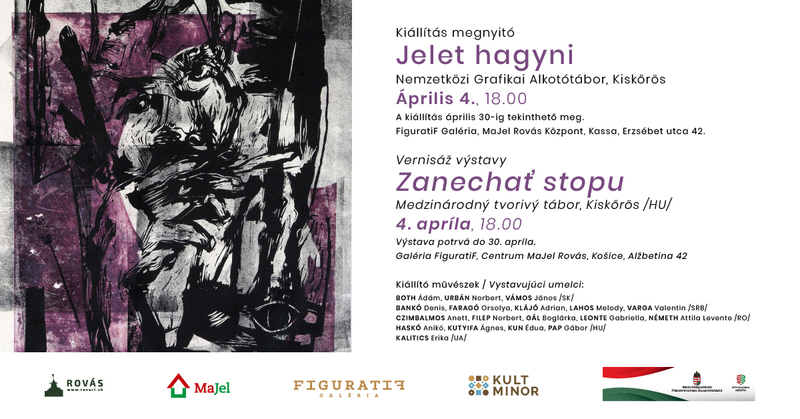 At the FiguratiF Gallery of the MaJel Rovás Centre, an exhibition of painter Imre Makai from Hajdúböszörmény, Hungary has opened. The exhibition is available to the public until 10 December 2018 at Alžbetina 42. Our summer residencies are the best opportunities to cleverly use your free time. Hungary is holding the presidency of the Visegrad Group, which inspired the exhibition entitled “SoundWeaving V4 Edition”. Another exhibition, entitled “Entrée V4” is a selection of the final year projects of V4 university graduates of 2017. Medgyaszay was one of the most distinctive individual architects of the 20th century - he designed the first theatre made of reinforced concrete in Hungary - even the first of the kind in the world - in Veszprém (in 1907) and later in Sopron. This exhibition is unconventional. The viewers may see the works of 10 artists, among them four recipients of the Munkácsy Prize and one recipient of the Kossuth Prize, exhibiting together, to show their support to Rovás. Every year, the members of eNRA create an abundance of works, different in style, technique and theme; however, their exhibitions are harmonious, because their leitmotif is the common way of thinking and unity. One of the goals of the Young Architects' Forum is to perform advocacy in favor of the architects, urbanists and landscape architects of Hungarian ethnicity, supporters of Hungarian culture, active in Southern Slovakia. This year, the eNRA exhibition celebrates its 5th anniversary. The international group of artists, founded by Rovás was established in 2012. Since then, it has been exhibiting the works produced at its creative summer camps every year. The lost Jewish memorials, photographed by photographer Libor Cabák from Valašské Meziříčí, Czech Republic. The pictures depict once existed synagogues and cemeteries from Bohemia, Moravia and Silesia; however, also local documents from Košice, Slovakia have been added to the exhibition. The aim of this exhibition is to commemorate the strangers and fellows, who - as it turned out - went through hell and lived among us in silence, with the burden of their memories, for decades. And let us also commemorate those people unknown to us, whose faith was to die. HONORÉ DAUMIER was among the first, who fully utilized the expressive power of lithography and used the content to accuse their own era. His list of works is long, since he made almost 4000 such plates during his life. The new centre of Rovás, the House of Hungarian Presence hosted an exceptional exhibition. Only a single image was exhibited – a very good copy of the Iberian painter Esteban Murillo (1617–1682). The Hungarian system of values includes not only tangible products and services, but also intangible assets. Márton Barabás is a man of abstract art, he makes paintings, sculptures, installations and sculptures made out of books. The artist creates his sculptures made out of books using mainly internal components, hammers and keys rescued from discarded pianos. The eNRA, active under the wings of Rovás, is having its fourth annual exhibition at the Main Square gallery of the Mining Museum in Rožňava, Slovakia. This year, almost 70 works of 28 artists are exhibited in the gallery until 26 January 2017. Pál Kő is both an innovator and an artist respecting and incorporating traditions, who has been working for eternity for quite some time. His art is genuine Hungarian sculpting. Miklosovits' drawings range from the precise graphics, restricted only to a few lines, concentrated expressions, to the detailed drawings, to individual graphics using monumental positive and/or negative forms, full of symbolism and to prints using various techniques. The issue of migration in Europe in today's terms gets into the awareness of people rather in a negative sense. On one hand it is caused by the problems that migration brings, on the other hand it is related to the well-founded fear of migratory pressure. The artistic views of Tibor Urbán are based on a feature unique to him, a specific aspect: the aspect of expressing perpetual value beyond the reality depicted in his images, seen in his inspiration. Did you know that Red Rock Canyon, being only 20 minutes from Las Vegas and the icebergs of Alaska have a lot in common? The photographs by Oszkár Kovács (Slovakia) let us play with colors and shapes. This exhibition displays the works of the artists' club created during the last few years. This club is a place gathering people having different artistic views: different approaches to the human spirit and soul. They process their artistic ideas using various approaches and techniques. The power of eNRA lies in its multifaceted nature, in emphasizing and focusing on the extraordinary, in respecting the craft and artistic freedom. TAG was not brought to life by a unified style of art or concept, but rather the tight personal and professional relationships, which came to life during the years. The exhibition of painter Ottó Szabó, celebrating his anniversary this year, opened in the Gallery of the Gyula Szabó Memorial House in Lučenec, Slovakia, on 6th November 2015. The opening speech of the exhibition was held by Ágnes Kovács, his wife. Below you may find the opening speech. One might ask why artists like electronic tools. In the better case to remain contemporary. Experimenting is another good reason. The worse case is that the artist does not have the necessary skills and/or talent. In this short series of articles, we will be looking at the Syrian refugee crisis from various angles (humanitarian, political, social and economical) and with as much facts and truth as possible so that when we try to construct an opinion or point of view about the crisis. During the summer of 2015, the artistic group Rovás organised its international creative camp of fine arts entitled “Értjük egymást – Rozumieme si – Ne intelegem” (we understand each other) for the 6th time. 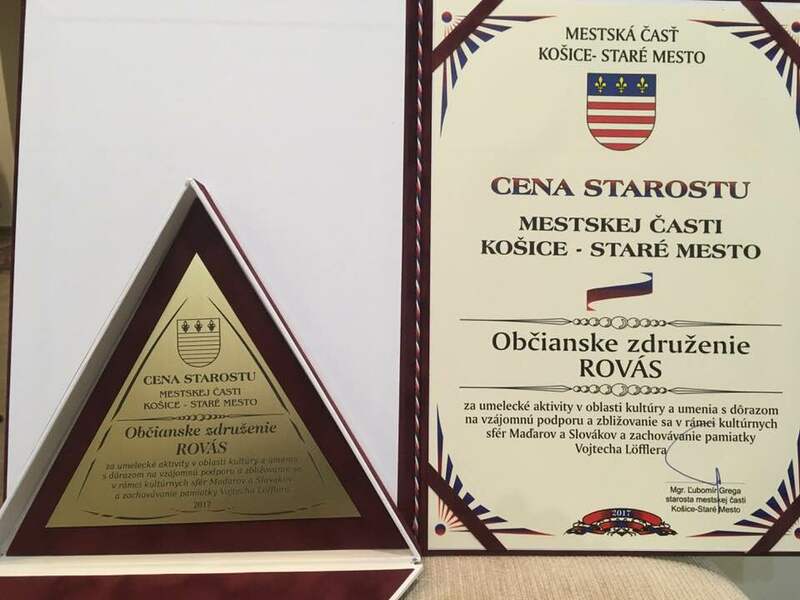 The NGO Rovás was awarded the Hungarian Quality Product Award. The prestigious title was received by Ottó Szabó, the chairman of the NGO in the Hungarian Parliament in Budapest. This year's summer exhibition is a compilation of the works of a painter and art teacher living Hungary, born in Košice, Slovakia. Her name is Kiss-Palencsár Ildikó. At last, Rožňava Summer has arrived in Košice! The Mining Museum in Rožňava and Rovás Academy of Košice have teamed up to set up an exhibition entitled 'The Guilds of Rožňava' at the premises of the latter institution. The ever recurring theme in the sculpting works of Jozef Kužidlo are heads. This is how he feels about it: "Why the head? The head was the first thing impressing me - faces tell stories sooner than mouths." The photos of Róbert Németi appeared in articles and on title pages of numerous papers, such as The Times, Daily Mail, The Daily Telegraph, Daily Mirror, Guardian, Daily Express, Metro, The Independent, The Sun and The Star. The history of the Jews in Rožňava dates back to the middle of the 19th century, when the first Jewish merchant, Albert Glatter settled down in the town. Rovás is a budget-less organisation, a grassroots initiative, in which everyone works as a volunteer. Our members do not make a living of Rovás - it is the members who sustain it. It is a very important detail and our strength. Villages, cities. This was the title given by József Borisza – nicknamed Borsó (Pea in Hungarian) – to his first independent exhibition opened in the Gallery of Rovás Academy on 31st December. eNRA stands for an intellectual community, it isn’t a style but rather a kind of conduct. The group’s current exhibition can be seen at the Mining Museum in Rožňava, Slovakia. The exhibition’s title is 40/20, which refers to a double jubilee: the artist celebrates his 40th birthday this year, as well as his 20th anniversary of his career. Nowadays presentation of masters and pupils is a fashion and it makes me happy. Sometimes young artists – graduated at art college - do not consider as an important information who was their master. Visual arts have been an attraction for her since her childhood – she has been chiseling her talent with an open mind over the years. She is a very creative artist developing and forming her own talent humbly, but with a specific goal in mind. The 5th international workshop’s first part called Értjük egymást – Rozumieme si – Ne intelegem took place at a traditional scene, in Középajta (Aita Medie) of Kovászna county (Covasna) from 11th to 20th July held by Rovás. Gyula and Kálmán Tichy who had been working at the turn of the century and praised by contemporary criticism are also well recognised representatives of both inland and the Hungarian Secession. On 22th May a new exhibition has opened its gates in the gallery of Rovás Academy in Košice to distribute works of the 3-year-old Moving art group. The power of “eNRA” is based on its variegation, emphasizes art’s individual and specific features, honours the vocation and the right to artistic freedom. Attila Csáji is an internationally recognized painter, holder of the Munkácsy Mihály Award and as the vice-president of the Hungarian Academy of Arts (MMA). Thus he has been chosen as the mentor of the 20-year-old Rovas Civil Organisation. The BillboardArt is the excellent and unique competition of Rovas. 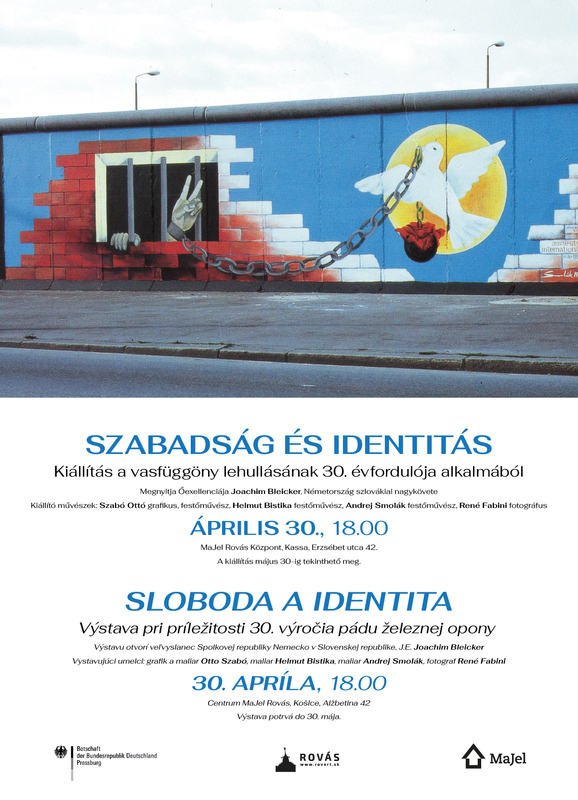 The Rovas Academy in Košice is hosting László Dániel's exhibition inspired by the pilgrimage to Șumuleu Ciuc. The exhibition with 32 paintings is open to the public from 13th of March to 22nd of April. The exhibition ”The Renewal of Our Built Heritage” by The Teleki László Foundation and the Magyarság Háza of Budapest is coming to the Gallery of Rovas Academy after its Transcarpathian round trip. The exhibition can be seen from the 18th of February until 13th of March. The Rovas Civil Organization is organizing the 5th "Értjük egymást - Ne intelegem - Rozumieme si " (“We understand each other“ - translator's note) summer camp which will be held at 3 different places, usually with the same participants. More than 50 photos showing us the beautiful natural heritage values on both sides of the boundary, can be seen at Rovás Gallery in Košice. The Rovas art group has held an evaluation day with symposium and free artistic workshop. The two-day long meeting included creating new works, a dramatic performance and a concert. The eNRa was established in 2012 under the aegis of Rovas thanks to Rovas summer workshops and creative camps organized over the past 20 years. These events have been organized at 3 places in the last 4 years: in Transylvanian Aita Medie, Košice and Tihany. Music has its eyes-states Daniel Vass with his portraits. These artists do not accept anything conceptual, they are against the modern global trends. They create, because they love to create, not because they have to. Their work is based on creativity and flexibility. Their credo can be the following: FREEDOM in ARTS. "We Understand Each Other" states the title of the international art camp organized by Academy Rovás. 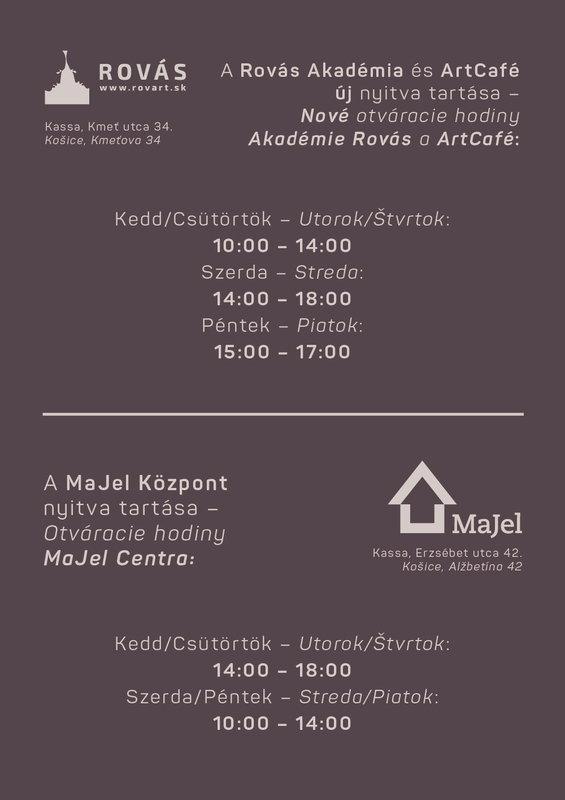 There is a new art exhibition on display in the Academy Rovás in Košice these days. There one can see some popular works of famous artists from the Košice and Rožňava regions. The precious panel painting of Roznava known as Metercia among professionals is exactly 500 years old this year. Due to the cooperation between Rovas and the Mining Museum in Roznava (Rozsnyó-Rosenau), a summer-long exhibition will be presented in Kosice (Kassa-Kaschau), one of Europe’s cultural capitals, called Roznava summer in Kosice. The eNRA (International Rovás Creative Camp) was established in 2012 under the aegis of Rovás as the courtesy of creative summer camps. It is an international group, though the members are mostly of Hungarian ethnic origin, from Slovakia, Transylvania and Hungary. Értjük egymást – Rozumieme si – Ne intelegem The schedule of the Rovas art camps for the summer 2013. BillboardArt- Hungarian billboard art alongside the access roads of Kassa. The Rovas Civil Organisation has invited Hungarian artists for a 'BillboardArt' competition in 2013. This competition is a part of the project 'European Capital of Culture- Kassa 2013'. The editors open the fifth issue of Enter with a poem-editorial from the young Bulgarian poet and scenario writer, Ivan Landzhev. They were impressed by the provocative idea which winds through the poem – how a city appears with all its afflictions – lovely and inspirational.